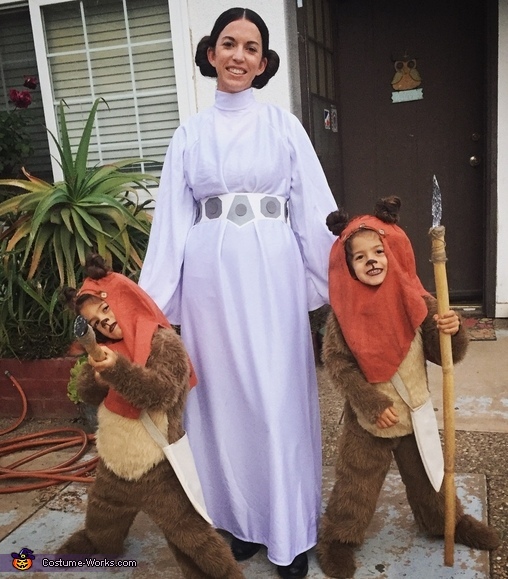 The two little ewoks are my 4 year old twins and I decided last minute to be Princess Leia. We watched Return of the Jedi one night and they LOVED the ewoks! Also the thought of having "spears" was so exciting! I sewed their suits using faux fur and attached them to long sleeved shirts and pants so it wouldn't be itchy. I covered cheap slippers with the faux fur for their feet. They both have long hair so we used it to make the ewoks ears poking out of the orange hoods. The face paint was waterproof brown eyeliner, which mostly got rubbed off during the night! And the spears were made from bamboo stick, foil for the top and wrapped with twine. My Leia costume was pretty basic, I was given the white dress so I made the belt from construction paper and ribbon. My hair was two sock buns, which I learned from a you tube video! My boys love animals so being an ewok for a night was pretty much the best thing ever! !